Before we know it, summer will be over, and people will be heading back to school or college. Frankly, it still feels strange to me not to go down an aisle and fill my cart with two-for-$1 bags of pens and a dollar's worth of 10 cent spiral notebooks and folders. If you're really organized, you've probably made yourself a checklist of things to buy, or things to pack to take to the dorm. This list is all of the things you don't want to find yourself without on the first day of school (that should include an umbrella and flu medicine, but that's a different tale for a different time). 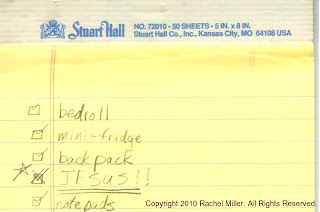 If you have such a list, be sure to put Jesus on it. 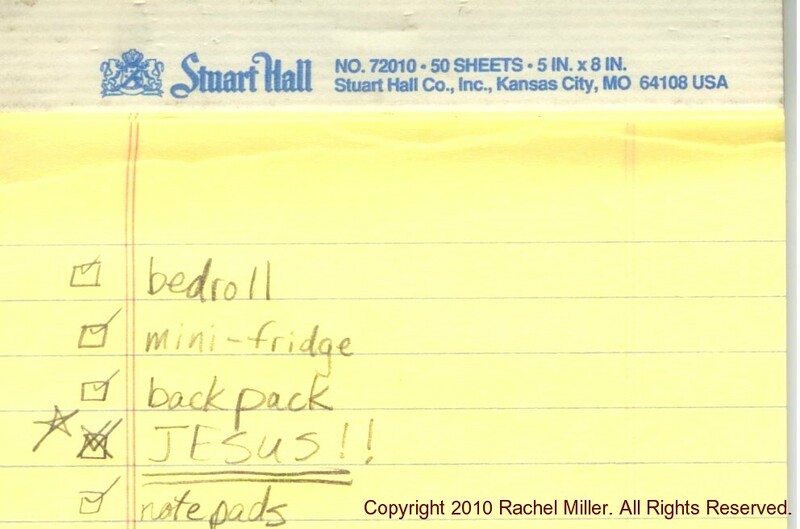 Sure, you can't throw Jesus into your shopping cart when you're at the office supply store, and you can't stuff Him between your bedding and your laptop in the back of the car. Even so, He's the only way you're going to make it through a school year. Take it from someone who spent most of 17 years in a classroom setting. The Bible says, "The fear of the Lord is the beginning of wisdom, and knowledge of the Holy One is understanding" (Proverbs 9: 10 NIV). The world is full of many things called "wisdom," and lots of things called "knowledge." Many of these things are essential for your career and your ability to function in society. I'm not here to talk down about them. Study is a good thing, and I think it's good to apply yourself. However, if you are looking for a way to live that won't steer you into a disaster, you need to start with Jesus. No amount of "worldly wisdom" can bring you success if you lack the spiritual guidance of Christ, whether you are a failing student or a highly-decorated PhD candidate. For the message of the cross is foolishness to those who are perishing, but to us who are being saved it is the power of God....Where is the wise man? Where is the scholar? Where is the philosopher of this age? Has not God made foolish the wisdom of the world? For since in the wisdom of God the world through its wisdom did not know him, God was pleased through the foolishness of what was preached to save those who believe. (1 Corinthians 1: 18, 20-21 NIV). This "foolishness" is the moment where we depart from all the opinions of the "wise men" of our day and decide for ourselves that we are going to take the rope that has been thrown to us. Is it easier to believe in cold, honed "facts" that give us no hope or guidance, or shall we accept what we feel in our hearts is true and right--basing all on a faith that by its nature cannot be sterilized and dissected by science? I have found that faith in the truth of the Bible is more than just grasping at a thread. When you grab on to it, you will see that the truth found in Christ is the warp that weaves everything together and finally makes sense of it all. As David wrote, "Your word is a lamp to my feet and a light for my path" (Psalm 119: 105 NIV). There's one more thing left to say about this. When you take Jesus to school with you, He's not just a tool to be used to get good grades, and He's not just a bunch of words to live by. Jesus is your friend. There will be moments in every student's life when it feels like there are no friends out there, or that the only friends you have are the kind who will leave when things get rough. Who is the friend who will always be there? The Bible says, "A friend loves at all times, and a brother is born for adversity" (Proverbs 17: 17 NIV). There will be good friends in our lives who assume that role as friend and brother, but Jesus alone fits that description 100% of the time. He's the first responder when we're in trouble, He's bigger than the schoolyard bully, no situation is beyond the scope of His knowledge and advice, He's patient when we're rotten, and He'll forgive us when we ask Him. What better school buddy can be found? I leave you this week with this, my best advice for a good school year. Take Jesus to school with you. Stay close to Him and always be willing to follow His lead, and you'll be reminded again of how great He is when you see His power displayed in your life! Rachel, good read. Thank you especially for sharing your experiences with us. My most favorite part was "This "foolishness" is the moment where we depart from all the opinions of the "wise men" of our day and decide for ourselves that we are going to take the rope that has been thrown to us." The irony of that verse is that being a Christian seems much less "foolish" once you've become a Christian and are viewing it from experience and with the understanding given to you by God (Luke 24: 13-32). It's not that you are brainwashed into that thinking; it is just that suddenly every broken line of logic makes sense and a lot of unanswered questions get answered. What a great feeling!